The moment of pride is when you beget your child; it makes you realize the joy and divinity of parenthood. Though proven medical advancements treat any sort of fertility problems, divine grace is essential in the first place for these treatments to work out well for you. When the circle of positive radiations surrounds you, all the complications that stand on your way of begetting a child would be smoothened. Experience our spiritual therapies to rejuvenate your spirits and to heal your fertility problems. 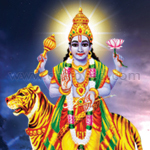 Rahu is a Nodal planet. It does not own any sign in the natural zodiac. 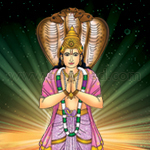 However, it acts as an agent for the owner of the sign in which it is placed and also as an agent for the overlord of the star in which it is placed. Rahu when placed in fiery signs would render a fierce nature and will exploit all subjects with an aggressive thirst of quest. 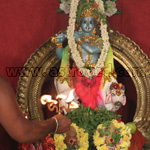 Garbarakshambiga homa invokes the blessings of Goddess Parvati in the form of Garbarakshambiga. Her blessings can remove all obstacles in the quest of couples to beget a child and also smoothen the process of motherhood. 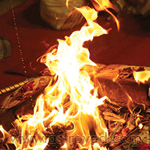 Santhana Gopala Fire Lab- This Fire Lab is targeted to bless you with a child, and protect expectant mothers against miscarriages and ensures safe delivery of the baby as well.